The long planned day had finally arrived. Janni F, der alter Verbrecher, was in town and we could finally go on that three day weekend, that we had been talking about per email and over Skype for the last six months or so. We left Davis at 6 pm on Thursday night just to realize in Sacramento that I had forgotten my hiking boots. Great, since I did not want to hike in my sandals we had to turn around to pick up the shoes and Jan got an opportunity to buy some breakfast at the Coop. But then at 7:30 we finally hit the road and drove down 99 and then over on 120 to the Dimond-O campground in the Stanislaus National Forest. I have stayed there half a dozen times before and like it a lot, because of its remoteness and occasional bear experience. Well, at least I have in the past heard the bear rummage through the garbage cans. Thinking about that actually reminds me that it is not really anything to be happy about. The bear goes through the garbage because we dump our garbage there, etc, etc. Better not continue going down that road……Anyway, we set up camp trying not to wake the whole camp, and slept. The next morning we were on the road at 7 and got to the Cathedral Lakes trailhead at shortly after 8. There were already a few cars at the trailhead but that was to be expected since this is one of the most popular areas of Yosemite and many people leave from here for over night trips. We packed out stuff and were soon ready to go. I knew that we were supposed to follow the Cathedral Lakes Trail for 3 miles or so before a use trail would verge off to the left leading to the base of the mountain as I had been here before earlier in the summer. However, at that time I had failed to find the turnoff and had therefore ended up climbing Tresidder Peak, a little further down the trail towering over upper Cathedral Lake. The whole time I had eyed Cathedral disappointed that I did not find the way to its base. And since time it did work. As soon as we got to the highest point and we could see the mountain, we headed straight left cross-country to the base of it. After a gradual incline at first, we came onto fun class 2-3 slabs and eventually I topped out on the northern ridge. I peaked over the other side and actually thought it looked much easier than what we had done. However, later on I met a guide who told me that is actually much harder. I will have to try it some day. Janni had taken the direct route aiming at the summit and I headed over along the ridge to hook up with him again. Now the climbing became a little bit more tricky and definitely class 4, although good holds and wide enough ledges to stand on made it all doable. After another 50 feet of climbing I reached the summit block. One has to walk around it in order to find the crack leads all the way to the top as from the west the summit block consists of just one sheer face of rock. We sort of got into a traffic jam, because a Yosemite guide was leading one client to the summit. She was already the summit and secured her 50-year old and triple bi-passed client with a robe. However, the client took a break before committing to the final 10 feet climb and I squeezed passed him to sit moments later on the summit of Cathedral Peak. I say “sit”, because standing is not really possible, at least not when another person is on the summit plateau. Eventually the client reached the top as well and the little space up there was at its capacity. It had taken the guide-client team 5 hours to get to the top (as compared to our 2 hours) and with a look at the threatening clouds moving in from the southwest, the guide felt it was a good idea to get off the mountain as fast as possible. Janni and I were only glad to follow suite, but not without checking out the Eichhorn pinnacle. 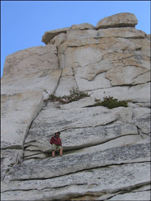 In Bob Burd’s trip reports, he made it sound like an fairly easy hike to the top, but I could not see which we one should take. Everything from where I stood (the ridge connecting the summit with the pinnacle) was definitely too exposed for free-climbing. Maybe on the other side an doable route could be found, but the bad weather (it started snowing) caused us to abandon any hope of climbing the pinnacle as well. Next time. We descended fairly quickly, while the client-guide team was still high up on the mountain. It would surely taken them a long time to get down at the speed at which they were moving. The client was robed almost the entire time (I learned from the guide) but he still felt very insecure. Coming down we saw a fair amount of puddles on the path (what we had felt as snow higher up, had already melted) but the clouds had moved on and it was again sunny. After getting back to the trailhead we drove east to relax a little bit on the beach of Tenaya Lake, before leaving the park over Tioga Pass and setting up camp at the Hot Tub. Best invention ever, the hot tub, especially if one can linger in its warm water while observing tomorrow’s destination Mount Morrison, out of Convict Lake.